The best way for employers to maximize employees' strengths is through their managers. People who use their strengths every day are six times more likely to be engaged on the job. That's just one big finding from decades of Gallup research into human behaviors and strengths. That research has established a compelling connection between strengths and employee engagement in the workplace -- a connection that has the power to accelerate performance when companies work on enhancing both simultaneously. The best way for people to grow and develop is to identify how they most naturally think, feel, and behave -- their talents -- then build on those talents to create strengths, or the ability to consistently provide near-perfect performance. Gallup works with businesses worldwide to help their employees discover their innate talents and apply them productively to achieve performance outcomes. In our extensive research, Gallup has found that building employees' strengths is a far more effective approach to improving performance than trying to improve weaknesses. When employees know and use their strengths, they are more engaged, perform better, and are less likely to leave their company. Gallup tested these items using samples of the U.S. working population and discovered that 3% of employees could strongly agree with all four of the Strengths Orientation Index items. This low level of agreement shows that the vast majority of businesses in the U.S. don't focus on helping employees use their strengths -- and this is a costly oversight. When employees feel that their company cares and encourages them to make the most of their strengths, they are more likely to respond with increased discretionary effort, a stronger work ethic, and more enthusiasm and commitment. The best way for employers to maximize employees' strengths is through their managers. But what happens when managers choose to ignore their employees or focus on their weaknesses instead? To test the effects of a manager's approach to engagement and strengths, Gallup conducted a study with a random sample of 1,003 U.S. employees to determine how much they agreed with two statements: "My supervisor focuses on my strengths or positive characteristics" and "My supervisor focuses on my weaknesses or negative characteristics." Gallup put employees who did not agree with either statement into an "ignored" category. One-quarter (25%) of American workers fell into the "ignored" category, and 40% of these employees were actively disengaged. Managers who focused on their employees' weaknesses cut active disengagement roughly in half, to 22%, proving that even negative attention is better than no attention at all. By contrast, for the 37% who agreed that their supervisor focused on their strengths, active disengagement fell dramatically to 1%. What's more, nearly two-thirds (61%) of these employees were engaged, twice the average of U.S. workers who are engaged nationwide (30%). This suggests that if every company in America trained its managers to focus on employees' strengths, the U.S. could easily double the number of engaged employees in the workplace. A supervisor's approach to strengths has such a profound effect on engagement because managers play a crucial role in maximizing employees' opportunities to use their strengths every day. Managers can empower employees to discover and develop their strengths and position them in roles where they can do what they do best every day. Investing in and focusing on employees' talents boosts employee and customer engagement. 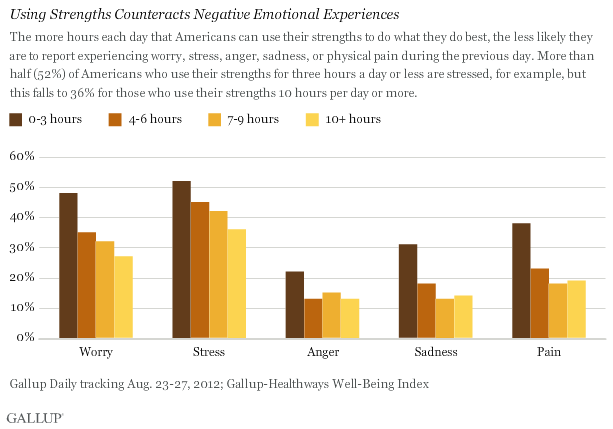 Gallup's studies also show that using strengths leads to improved health and wellness outcomes. The more hours each day that Americans can use their strengths to do what they do best, the less likely they are to report experiencing worry, stress, anger, sadness, or physical pain during the previous day. More than half (52%) of Americans who use their strengths for three hours a day or less are stressed, but this falls to 36% for those who use their strengths 10 hours per day or more. Don't assume that employees know their strengths. People often take their most powerful talents for granted or may be unaware of them. Gallup's Clifton StrengthsFinder assessment has helped more than 9 million people worldwide discover their greatest talents, and companies can easily use this tool as a starting point for building strengths orientation in the workplace. Find ways to apply strengths in a team setting to achieve common goals. Help coworkers learn and understand each other's strengths and how their talents complement those of others on the team. Consider posting employees' top five themes in their offices or cubicles. Use team meetings to help team members deepen their understanding of the strengths approach, and assign team projects based on employees' strengths. Incorporate strengths into performance conversations and reviews, and help employees set goals based on their strengths. Create a community of strengths advocates and champions to act as internal experts who help everyone in the company use his or her strengths. These people will help with initial launch efforts and sustain those efforts through the entire company's strengths journey. All employees have strengths -- the unique combinations of talents, knowledge, skills, and practice that help them do what they do best every day. These strengths provide employees and employers with their greatest opportunities for success. What leaders do -- or fail to do -- with this workforce potential has enormous implications for a company's future. Gallup's data show that simply learning their strengths makes employees 7.8% more productive, and teams that focus on strengths every day have 12.5% greater productivity. Investing in and focusing on employees' talents boosts employee and customer engagement, according to Gallup's research, leading to higher levels of performance, profitability, productivity, and greater earnings per share for businesses.